Are your summer trips always packed with crowded beaches, or spending all day in luxury resorts but have nothing to bring back home? Imagine that you are not only relaxing on beautiful hidden beaches, but also discovering an ancient civilization that has been existed for hundreds of years. 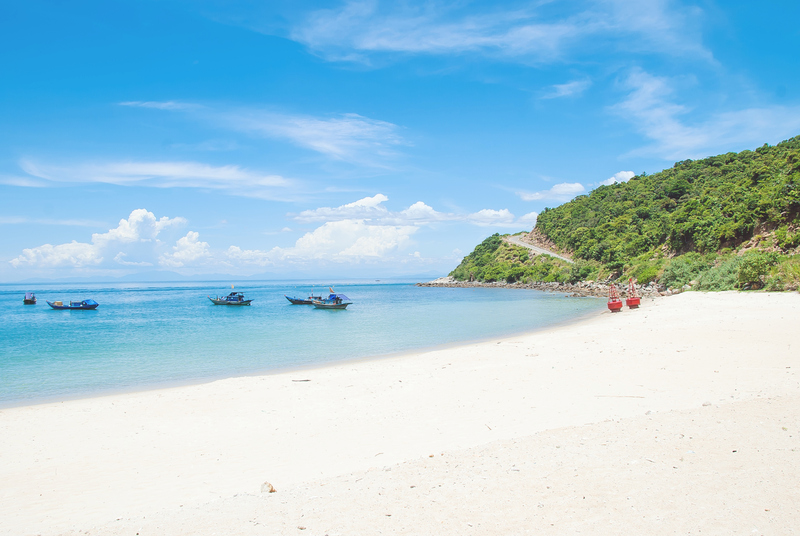 If you're impressed with Hoi An's An Bang beach, just wait until you see the charming Cham Island. Found in central Vietnam East Sea, Cham Island does not need much time to make you fall for its long white beaches and sparkling turquoise waters. Here, you can explore the serene and pristine beauty of isolated beaches, bargain for some fresh seafood in the local market or experience night squid fishing. Whether you're craving for undiscovered natural landscapes, adrenaline activities or cultural excursion, Cham Island is certainly the place you should be once in your life! Despite its close proximity to famous tourist attractions like Hoi An old town, Da Nang city, and Hue city, Cham Island remains unspoiled vistas and glimpses into way of life that has altered little over the last several centuries. There are plenty of ways to get to Cham Island but there is only one way to see it fastest, cheapest and most convenient. Read on to know how your trip to Cham island is going to be with the help of an experienced local guide on one of our best Cham Island tours from Hoi An. Hassle-free and insightful experiences are exclusively brought by Inspitrip! Eight nautical miles off the ancient trading port of Hoi An, Cham island is a cluster of eight small islands, which has been recognized by UNESCO as World Biosphere Reserve (Cu Lao Cham Marine Park). This ideal destination is not only endowed with marvelous rugged mountain slopes, biological diversity but also embodies artifacts proving the existence of the Cham people's civilization for hundreds of years ago. Moments after arrival, you will immediately be welcomed by the wild beauty of pristine islands, lovely people and the sacred relics hidden far behind the seafood market. Everything is well set to give you the most amazing adventure ever! Eight islands of Cham cluster are Hon Lao, Hon Dai, Hon Mo, Hon Kho Me, Hon Kho Con, Hon La, Hon Tai, and Hon Ong. The main island, Hon Lao is the largest and the only one inhabited, in which almost all activities happen. The island has seven beaches with distinct characteristics that will surely meet your tastes, whether you're a nature lover or an adventure seeker. 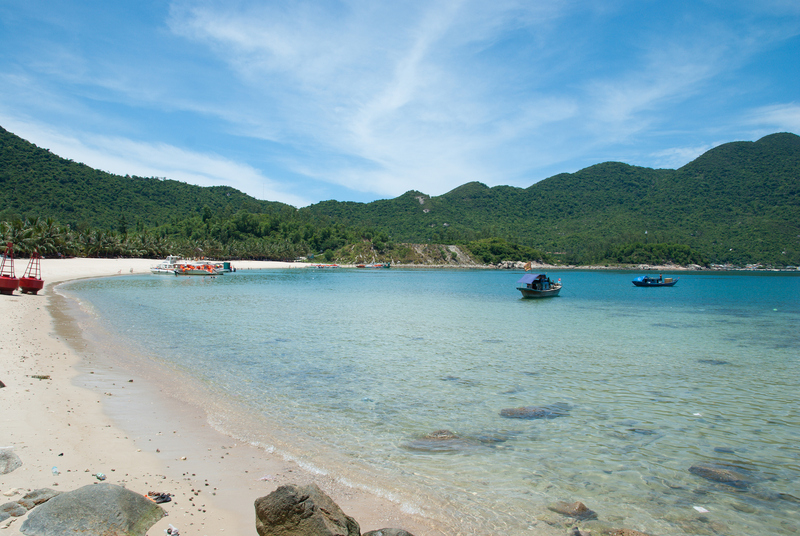 Cham Island offers a wide range of leisure activities in a picturesque and pristine setting. You can enjoy swimming in crystal-clear sea waters, sunbathing on the long-stretching white-sandy coasts or explore the lush forest of Bai Xep, Bai Chong and Bai Bim. All of them are approximately 20 meters wide, 100 to 300 meters long, with the deserted and tranquil beaches that are ideal places for taking stunning shoots, comfortably immersing yourself in the immensity of the sea, and relaxing in the cool waters. If you want a place with lesser people, make a visit to Bai Bac, the northern beach with lots of natural caves will immediately give you a sense of discovery. For those who are interested in marine life exploration, there is a myriad of water activities that cater to all ages and swimming abilities. Snorkeling and scuba-diving are undoubtedly the best way to see up-close the beautiful coral reefs of Cham Island Biosphere Reserve. The Cham Island Marine Park consists of 165 hectares coral reef, 500 hectares of seaweed and seagrass beds, in which hundreds of sea creatures reside. Once into the water, expect to encounter a rich marine world with an abundance of colorful fish, lobsters, mollusks living under the clear-water surface. However, make sure to always follow the instructions of your guide so as to enjoy the beautiful corals without causing any damages or diminishing the biodiversity of Cham Island. A non-swimmer but still want to see the coral gardens? An oceanic expedition on a glass-bottomed boat or a sea walking tour will also help you to gain in-depth knowledge about the marine world. The activities are perfect for people from eight to 80 and do not require any physical practice before entering the underwater. The beauty of schools of fish and the coral reefs will blow your mind right away. Apart from the wild natural landscapes and interesting recreational activities, Cham Island is also a famous cultural-historical site, which witnesses the establishment and development of Hoi An city and is a home to sacred relics of Cham people's civilization and the Vietnamese people, dating back to the 17th century. Wandering around the main island, you can easily encounter ancient buildings that are hundreds of years old. Among those historical sites, the Cham Marine Museum, Hai Tang Pagoda, Ancient Well and Temple of Bird's Nest Business founder are must-see attractions that will give you insights into the long-established history and rich culture of the region. Hai Tang Pagoda was first built in 1758 at the mountain foot in the west of Hon Lao island and reconstructed in 1848 due to the destruction of a serious storm. The pagoda is a worshiping place of locals to practice Buddhism and to pray for their safety and prosperity. Once visiting the site, you will be impressed by the unique architecture of the pagoda as the red lacquer is delicately trimmed with gold sentences, spectacular statues, and a big bell. Cham Marine Museum is a place where the history, traditional customs, and marine specialties are introduced. You will get a chance to learn more about the history of the island's establishment, the traditions and customs of the local community and special sea creatures of this island. Cham people's Ancient Well or Xom Cam Well (the well of the forbidden village) was dug by local people about 200-year-old and still provides fresh water even in the driest season. It is said that a gulp of water from this well can help you to repel seasickness immediately. Temple of Bird's Nest Business Founder was constructed in the early of the 19th century to show the locals' gratefulness towards the protection of founders of bird's nest business and other gods of the sea. If traveling on the right time, you might have a chance to participate in a local festival celebrated by the locals on the 9th and 10th of March in the lunar calendar, in order to pray for a new harvest of bird's nest. The rural hospitality of locals and the bustle of seafood market are the first things you feel once you set foot on the island. 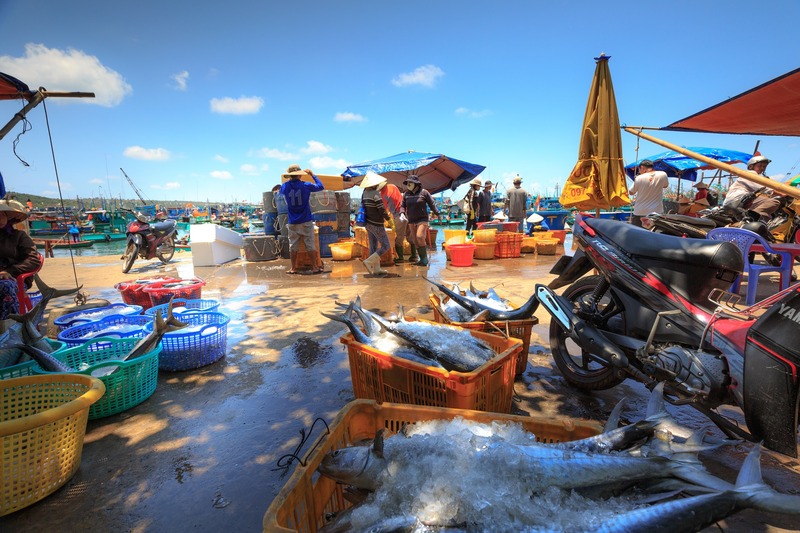 Tan Hiep market near Bai Lang fishing port is an ideal place for you to get a glimpse into the daily trading activities of local citizens as well as to look for fresh seafood and handmade products. Your local guide will help you with some bargaining tips when shopping here, guaranteeing to give you unforgettable experiences and great items to bring back home. Leading a simple and cordial life, local community on Cham Island is well-known for their environmental-harmonizing lifestyle. In a country where nylon bags are thought to be vital, you may find it surprising to get a fine of $22 if found using nylon bags on the island. Instead, local people and tourists coming to the island are encouraged to use ecological bags or canvas bags, which can be easily bought in Hoi An city or Cua Dai Pier. By giving strict policies and maintaining an environment-friendly lifestyle, local citizens and authority on Cham Island have successfully protected its untouched beauty, providing a home to a rich marine ecosystem and a long-standing culture. Is Cham Island really worth a visit? Absolutely YES! You might be impressed with the antiquity of Hoi An old town, the long-established history of Hue city or the beautiful coastline of My Khe beach in Danang, then you still have a lot to learn more about Central Vietnam. Consisting of eight islands and many hidden beaches, Cham Island with the wild beauty, unique cultures, and fascinating undersea world will certainly enrich your travel experience. If you're a nature lover, Cham Island will feast your eyes on some of the most beautiful white sand beaches in the country. You can spend all day tanning your skin on the beach of Bai Xep, explore the natural caves of Bai Bac or dive into the clear water of Bai Bim to immerse into the amazing diving scene and underwater life. The islands offer a perfect one-day retreat for snorkelers and divers of all level. If you’re on a hunt for some cultural values and historical experiences, Cham Island also possesses many cultural-historical sites with sacred relics dating back to the ancient Cham civilization such as Cham people's Ancient Well, Hai Tang Pagoda, and Lang Ong. Huong fishing village, Cham Marine Museum and the temple of Bird’s Nest Business Founder are also must-see places that will give you a glimpse into the traditional lives of the local community for hundreds of years. When is the best time to visit Cham Island? Lying in the Central Vietnam East Sea, Cham Island is surrounded by the tropical monsoon climate, which means the island is at its best during the summer months. In March, the climate becomes humid but still sunny, and the sea is clear and calm until August, making it a perfect condition for exploring the marine life and joining recreational activities. The rainy season lasts from September to February, when the islands are frequently attacked by serious storms and heavy rains. During this time, traveling to Cham Island is almost impossible as the sea becomes too dangerous to navigate and the coastguards also forbid boats and ferries to enter the islands. On the 14th and 15th of each lunar calendar month, local citizens light up the night with a tremendous amount of lanterns. The main island Hon Lao at night becomes more alluring as the lanterns throw lights and colorful shades to add dimension to this ancient town. If you're interested in the local culture, there are other two big events that should not be missed on your bucket list. On the 9th and 10th of March in the lunar calendar, Cham island people celebrate a local ceremony to show their gratitude to the founder of the bird's nest business and to pray for a new harvest of bird's nest. The second cultural event is Cau Ngu Festival, which is held on the 3rd and the 4th of April in the lunar calendar in order to honor the fishermen and to give their gratefulness because they are protected and well fed by the sea all year-round. Can I visit Cham Island by myself? Yes, you certainly can arrange your own trip to Cham Island! You can start from either Hoi An pier or Cua Dai pier, in Hoi An city, Quang Nam province. There are three ways to get to Cham Island. A private canoe is the fastest but most expensive way to reach the island. From Cua Dai Pier of Hoi An city, visit the ticket room and ask to hire a private canoe. You can travel with your large group of maximum 35 people and freely visit the island on your own. Still, the price is quite high, which varies from 5,000,000 VND (~$215) to 12,000,000 VND (~$516) depending on the size of the canoe. If you still want to travel by canoe but want to save some money, join with other guests. There are many tourist companies who sell tickets to Cu Lao Cham. Just head to the ticket room of Cua Dai Pier, and you can choose between a wide range of companies. This way, however, does not allow you to freely travel between the islands, because you must follow the route of the group. The price is around 300,000 VND (~$13) for a round-trip ticket or 200,000 VND (~$9) for a one-way ticket. The third choice is to travel by public wooden boat or tàu chợ, which means the boat to the market. This means of transport is also often chosen by many tourists due to its lower cost and motorbike carriage allowance. The price is just about 50,000 VND (~$2) and easily bought at the entrance of Cua Dai pier. This big wooden boat leaves daily at 8 AM and takes roughly 90-minute to reach Cham Island. At 11 AM, the boat will turn back to Hoi An city. Every day, there is only one boat traveling to and from Cham Island, so if you choose this option, you will have a limited time to see the island or consider staying at least one night on the island. A more convenient way is to join an experienced local on a guided tour, which costs only 520,000 VND (~$22). They are perfect for travelers who do not have much time to look for things to do on Cham Island and only have a limited time to see the area. If you're interested in sea exploration but not experienced in snorkeling or diving, a guided tour offers full packages for a pleasant sea trekking route or scenic glass-bottom boat tour. It also provides pick-up and drop-off service from your hotel in Hoi An or Danang city, accompanied by island entrance tickets and delicious seafood lunch. Professional local guides are carefully selected by Inspitrip to have your travel itineraries tailored for your needs and preferences, guaranteeing that you will experience all the best parts and gaining real insights without having to do lots of logistics. How long should I stay on Cham Island? The island is a perfect distance from Hoi An old town or Danang city for a day trip, which is enough to give you a taste of the area. However, an overnight stay is not a bad idea as the fantastic views at sunset and great memories at nightfall in the village are hard to miss. Cham Island does not have any resorts or five-star hotels since the locals want to keep its untouched beauty from being exploited by tourism. The main accommodation options here are hostels and homestays. The price varies from around 100,000 VND (~$4) per person or 150,000 VND (~$6) to 200,000 VND (~$8) per double room. In addition to hostels and homestays, camping on the beach is also a great choice to enjoy the open spaces and wild nature of this island. You can find this service offered by local people in Bai Ong and Bai Huong.